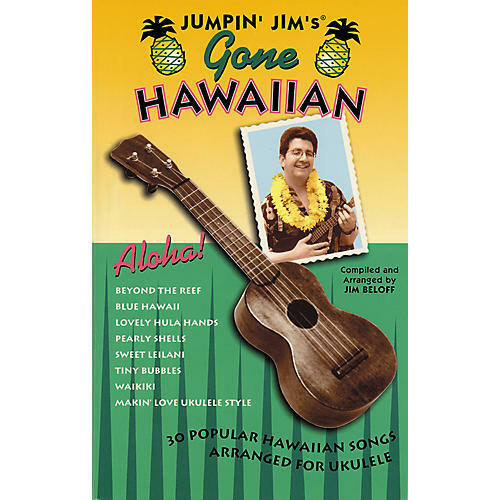 Flea Market Music's Jumpin' Jim's Gone Hawaiian Ukulele Tab Songbook offers you a collection of 30 of the best-known Hawaiian songs arranged for ukulele. Includes: Tiny Bubbles, Sweet Leilani, Pearly Shells, Aloha Oe, Ukulele Lady, Blue Hawaii, Mele Kalikimaka, My Little Grass Shack, Beyond the Reef, and 21 others. Features a biographical section on some of the most prolific songwriters, including Harry Owens, Johnny Noble and Sonny Cunha. Includes lots of photos and original sheet music covers, a foreword, and a complete ukulele chord chart.